My kids will be psyched about this one. About a year ago they discovered Poptropica on the web – it’s a fun little online world where kids can create characters and interact. Now, Poptropica has released a more involved and equally as fun game after its namesake for the DS! 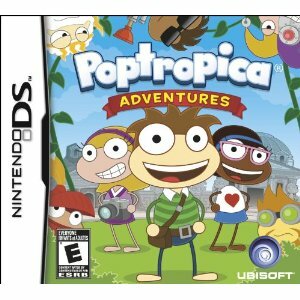 Poptropica on the DS is currently for sale for $44.99 on Amazon. The game is similar to the online world – the kids can create a character and play in a virtual world. But there are more mini games and it’s a bit more of a singular experience since it’s not connected to the Internet and it’s more on-the-go. It’s a great add-on for kids who love to play the site! There are three worlds and the kids can complete fun adventures and quests. Get Poptropica for the DS on Amazon for $44.99.